With 10-15% of uberX applicants not owning a car or having a vehicle older than nine years, Splend is helping remove one of the barriers to entry for prospective ridesharing applicants. Splend, an Australian start-up founded by entrepreneur Chris King, is helping open up economic opportunities for hundreds of Australians looking to earn a flexible, well paid, income on the uberX platform. In just over six months, Splend has had a significant impact on helping more than 350 Australians access the economic opportunities provided by the uberX platform – by offering uberX applicants the option to access a low-cost, brand new, and fully insured vehicles as a service. The Splend vehicles are sourced and serviced primarily through Automotive Holdings Group (AHG), Australasia’s largest automotive retailer with 179 vehicle franchises at 102 locations across Australia and New Zealand. “More and more people are seeking economic opportunities provided by ridesharing now that regulation has passed in NSW and the ACT. This is also evident amid new estimates the rideshare industry has contributed more than half a billion dollars to the NSW economy in the past year,” says Splend CEO Chris King. AHG managing director Bronte Howson is pleased to be able to work with Splend to meet the needs of the rapidly changing ride-sharing sector. In a new report commissioned by Uber – Economic effects of ridesharing in Australia, the growth of Uber, and particularly its uberX ride sharing service, is delivering more than $80 million in direct consumer benefits bringing significant opportunity for Splend as an industry enabler. 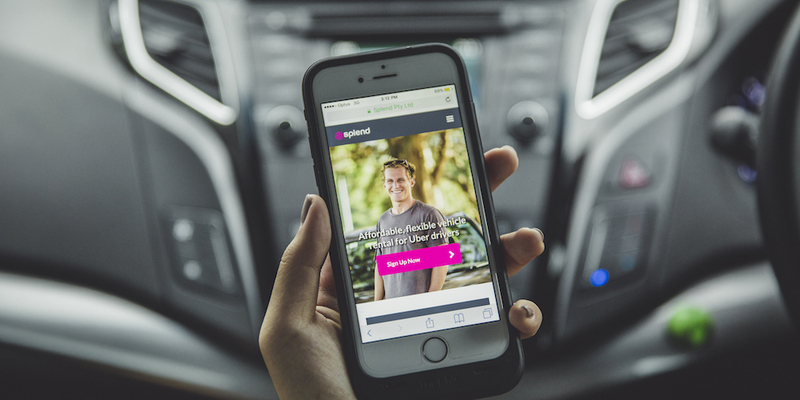 As the popularity of ridesharing continues to increase Chris says Splend is along for the ride. “One of the benefits of ridesharing is the opportunity to be your own boss offering access to well paid income and a flexible timetable compared to taxi drivers who are locked into 12 hour shifts,” says Chris. Full service vehicle provider with no lock in contracts: At $275 per week, Splend drivers have access to a new vehicle (valued at approx. $40,000) including registration, stamp duty, business grade comprehensive & compulsory third-party (CTP) insurance, and servicing. This also includes the upgrade of a new vehicle every 12 months to ensure Splend have the best fleet on the road. Comprehensive insurance: Splend has access to Australia’s ONLY fully comprehensive vehicle insurance for ride-sharing services to protect both drivers and passengers. Driver Benefits and Rewards: drivers are incentivised by rewarding them with holidays and monthly rewards if they are measured the safest driver by utilising the latest telematics technology installed throughout the Splend fleet. Flexible lifestyle: To offer as many people the opportunity to build their own business and be flexible enough to dictate their own working hours. To monitor driver accountability, Splend has partnered with FleetRisk, behaviour technology ensuring each driver is cognitively tested before their application is approved. All Splend-licensed vehicles are also fitted with Mercurien BetterDriver telematics, to track on road behaviour and driver safety. “WA and TAS are expected to follow suit in the coming months by introducing ridesharing regulation. Following the ridesharing regulation in NSW, we have received thousands of applications from new candidates interested in becoming an uberX driver and obtaining a vehicle through Splend. Both interest and demand have tripled, so it’s an exciting time for the rideshare industry,” says Chris.